Who's Scorched Up comScore In September, You Ask? What site has jumped five spots between August and September to become the 13th most visited site in the US, leapfrogging properties like New York Times and Viacom Digital? Here are some hints: It’s listed on the NASDAQ. It was founded in Israel and its R&D center is located in Jerusalem. It has raised funding from high-profile angel investors Dr. Yossi Vardi and Ron Conway. Can you name the company? Exemplifying that startups are long hauls, Answers.com, née GuruNet, has been plugging away since its founding in 1999. 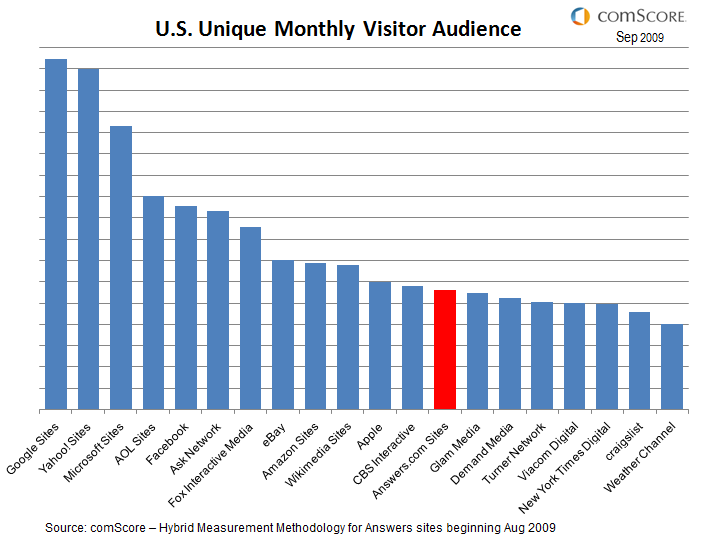 Ten years later, comScore’s September 2009 data places the reference and Q&A site as the 13th most popular site in the United States, pulling in 56.4M unique users. This is a whopping 25% increase on Answers.com’s August numbers. I had a chance to speak to CEO Bob Rosenschein this morning, who attributes the increase to a few factors. First, there’s seasonality. Answers.com is familiar with a traffic surge that typically comes this time of year as a result of students getting back to school. Second, Answers.com has chosen to integrate with comScore using Hybrid Measurement, a combination of server side and census measurement. This may have a real impact because sites that have chosen not to integrate in a similar manner may actually be detrimentally affected by comScore’s ability to gain better metric data from sites that have gone ahead with the integration. This means that comScore’s numbers can be off, but there’s nothing new under the sun here. The third reason is a bit more interesting as it sheds light on a little known fact. Answers.com consolidated WikiAnswers—its user generated Q&A—site into the Answers.com domain, thereby capitalizing on the aggregated traffic. What’s interesting through is that WikiAnswers is on a tear, with 5.6M answers submitted by some 3.6M registered members. 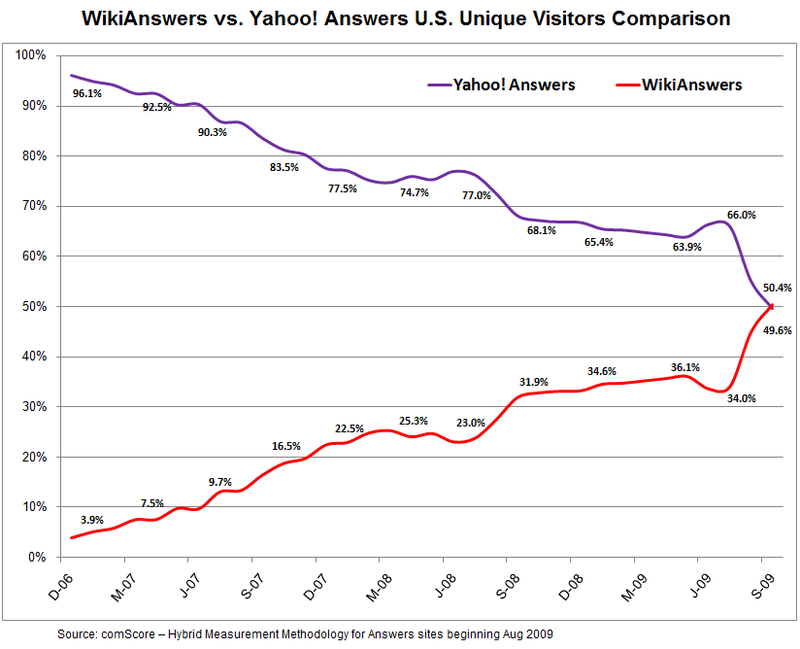 While attention to Q&A products/sites of late has focused on the likes of Vark and Hunch, WikiAnswers has just surpassed the 400-pound Q&A gorilla known as Yahoo! Answers, becoming the leading Q&A site on the web. Bet you didn’t know that. In 2010 Answers.com will be placing particular emphasis on extending its products into the mobile and social networking arenas. We’ll have to wait and see if these catapult the company’s traffic up even further.